A new upscale shopping center in Windermere Florida which may include a new prototype grocer should start construction this summer.. The 10 acre project to be located at 5799 Winter Garden Vineland Road on the northeast corner of County Road 535 and Ficquette Road in the Western Orlando area is scheduled to be called Windermere Village and cost $20,000,000. 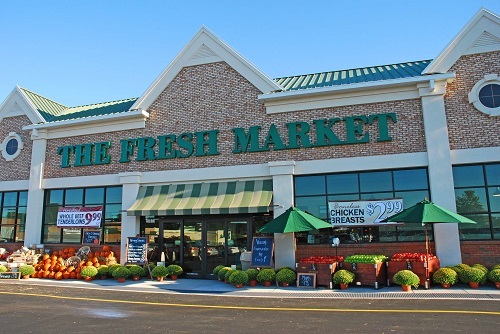 It’s first tenant Fresh Market was allegedly contracted around the first of March. It is said to have a 22,000 square foot location. Several other clients have shown interest in marketing there. The original story breaking in the Orlando Business Journal. Since then Agave Azul, Bruster's Ice Cream, Venetian Nail Spa and Clean Juice has also signed. Having plenty of seating and lots of open space there will be plenty of socializing at the new Windermere Village shopping center. Bidding for subcontractor opportunities and vendor packages may open in about just weeks for the project, which should be completed by early 2018, pending Orange County approving the permits. Those interested in getting more information on opportunities can contact Skorman Development Corp. at skorman@skormanconstruction.com. The shopping center will be built next to the new Windermere High School. It will resemble Winter Park’s Park Avenue, replacing orange groves with three one-story buildings totaling 50,000-square feet with outdoor seating and a large central park with a covered pavilion, Skorman told OBJ. Seeking high-end, dine in restaurants and service tenants such as a salon and a wireless phone carrier he’s aiming for an even mix of both national and local chains. Al of this bodes well for Real Estate values for the near future in the Western Orlando, Windermere area. I couldn’t be happier and can’t wait to go eat some pizza. If you are interested in Buying or selling a home a home in this area reach out to me. I offer a lot of experience and fantastic customer service. You can reach me in several places on this page. Moving to the Butler Chain of Lakes Area?Here are Some things that will help.